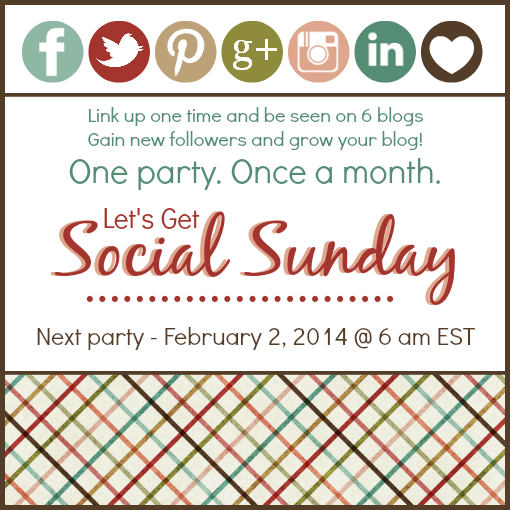 We are so glad to bring back Let's Get Social Sunday....and now it's even better, quicker, and easier to play! We know your time is valuable, so we removed all those extra steps of linking up your social media sites and simplified the party. Just link up your blog and use that extra time to interact and network with others by following their social sites that you find on their blogs! We will go live on the first Sunday of every month, and stay live until the last day of that month at midnight. So you'll have all month to make new friends and gain more followers! Now, link up your blogs, and let's get this party started! Happy New Year to you all, and thanks for this awesome party! Hi Joy! So happy to see Let's Get Social back for the new year! Thanks so much to you and the ladies for hosting. Have a happy Sunday and a great week! Great to be part of Let's Get Social again. Wishing you a blessed new year! Thank you so much for joining us! :) Happy 2014 to you and yours! Happy New Year everyone. It's great to get social again in 2014 . Joy, I'm right back into the parties..I guess I couldn't stay away. Thanks for hosting. Lynn, I'm sure glad you decided to come to this one! :) Thank you for joining us, and I hope you have a great week! Thanks for hosting this awesome party! I'm following on facebook! Thank you so much Ladies for the opportunity to join the Party!! So nice to see all your faces again!! Thank you, Joy! I hope your enjoying your Sunday! Theresa, I am so happy you could come- it's wonderful to see you here! I hope you have a great week! Sending Best wishes for the New Year! Happy New year,Joy! Thanks for the party. Hope to see you tomorrow at What'd You Do This Weekend. Hi Joy! New follower here. Thanks for hosting a great party!